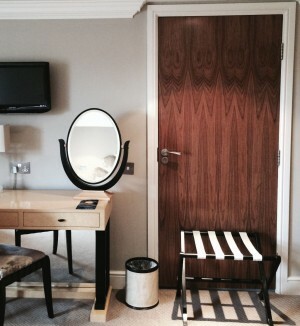 Entering a hotel bedroom with an adjoining door, can sometimes be an exciting surprise. Initially, you think it is a door into a mystical, if not magical wilderness, such a wilderness, that seeing as you haven’t paid for one, is all the sweeter for it being there. Another room, full of sofas and huge flat screen TV’s perhaps? Your bags, barely on the floor, the little shortbread biscuits not yet seen, nor eaten, the toilet not yet christened, your hand reaches for the mystical door. The excitement is the biggest thrill you’ve had since you found £20 in the pocket of your funeral suit. The door must lead to another part of your hotel room, which has obviously been upgraded to a suite! Once you rattle the handle, it might open. Sometimes they do, they open up, but not to reveal this plethora of upgraded room space, fruit bowls, and free notepaper, no! If they open, they simply reveal an identical door and much like a Russian doll, you attempt to open that too, hopefully to reveal the hidden treasure beneath this next layer of mystery. Unfortunately, the mystery soon diminishes, as when you discover the second door to be locked, the penny begins to fall. Access to Narnia denied, you now feel cheated, robbed of the trappings of free extra hotel room, but this will inevitably prove to become the very least of your worries. If you’re the unfortunate resident of the neighbouring hotel room, and some anonymous git on the other side of the door is rattling the handle, it always proves to be an unsettling experience. Some more tenacious handle-rattlers will pause, whilst their brain processes the fact the door has failed to open. Moments later, the rattling will commence once again, yet with the same consequence. After a ‘few pennies have dropped’, or in the most extreme of cases, ‘several pounds of small change’ has dropped, they cease attempting to gain entry to your private domain. The only situation that comes close to this is when occupying a public toilet, (which given an unhealthy hatred of such places), I avoid unless absolutely necessary. The door to your private space being tried is a frightening prospect. Like in a movie, I always fear the silence that follows the rattle of a locked toilet door, will be followed by the boot of the intruder, being forced through the door of your cubicle. Seated, ankles tied, vulnerable like a new-born foal, you remain motionless as the door of the cubicle rocks off the last screw holding the last hinge in place, as the monster that gained entry apologises and says, “sorry mate, wrong door”! Such words, offering relief as they do, prove insufficient to compensate you for the trauma you have just experienced. OK, you haven’t been assaulted in some intimate fashion, you have escaped (albeit without your dignity), but escaped all the same, for which you remain eternally relieved. Anyway, back to the hotel room. Realising the door is not leading to Narnia, you resign yourself to the modest room and small bathroom for which you have paid. Adjoining doors, I can only imagine are for use by parents traveling with young children, on whom they need to keep a close eye, whilst retaining as much shagging privacy as possible. When present between rooms of complete strangers, adjoining doors are in reality nothing but trouble. Many hotel walls are paper-thin enough for you to not need much imagination to know ‘what on God’s earth that couple are up to? !’ An adjoining door is simply a weak link in the paper-thin barrier separating you from your sexually athletic neighbours. Cries of ecstasy and exhausted pants are not the only noises you’ll hear from your inconsiderate neighbour(s). Most of mine over the years like to fart as if they’re in some kind of farting competition – the kind where more points are scored for volume and artistic execution, over any other aspect. Hearing the floor boards creak as your invisible counterpart shuffles about the room, interspersed with audible evacuations that are too intimate to share between strangers, is far too much for you to have to deal with on a Tuesday night in Kidderminster. Apparently, once I have slipped into an unconscious state, some allege that I have been known to snore. Only from the sheer weight of evidence presented am I tempted to believe such allegations, and come to terms with the fact that I might actually snore. These allegations by the way stem from nights spent with friends when camping and 20 years of my wife waking me up with the sharpest point of an elbow known to humankind, whilst screaming (exhausted and frustrated), at the top of her voice, for me to “shut up”! My hatred of adjoining doors not only stems from the reluctance to listen to flatulating insurance salesmen all night, but also from me inflicting what has been described as life-threatening snoring, on those next door. Life-threatening is so described, as I once awoke, (in a log yurt of all places), to find a supposed friend holding a pillow inches from my face, whilst he apparently seriously contemplated pressing it hard onto it, to finally, (and eternally), stop the incessant racket I was allegedly making! I think I woke up in just the nick of time, but subsequently lost half a night’s sleep for fear of nodding off again, never to wake up! Not only does noise permeate through the double-doored aperture, but unfortunately, so do odours. There’s little need for me to elaborate in great detail on this topic, but it’s important to be aware of the other pitfall of sharing a door with a complete stranger. I think the smoking ban has now been in force long enough for hotel guests to cotton on to, and I can hardly remember the last time I entered a room that stank of stale cigarettes. However, I have had the misfortune of having residues from tobacco smoke, cheap perfume that only an old woman would wear, bodily functions and cheap deodorants waft unwelcomingly under “my” adjoining door, for them to remain a very unwelcome and long since hated feature of any hotel bedroom!